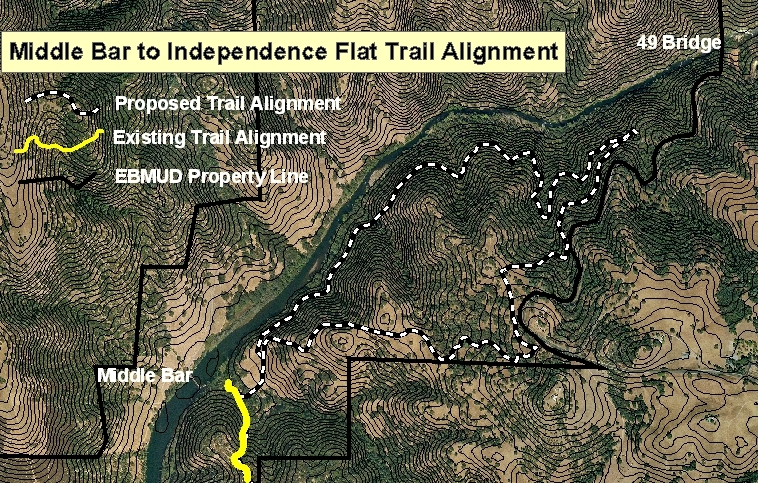 Here is your chance to preview the Middle Bar to Independence Flat segment, near the “Ore Cart” on highway 49 between Mokelumne Hill & the Mokelumne River. Trail construction will complete in late 2012. Description: Celebrate National Trails Days by joining Steve Diers, EBMUD Ranger II & special guest, Pat McGreevy, sharing information from his field research on the area’s gold rush history. The potential route for the narrow gauge portion is exceptional but there are some challenges to hiking it now (see “difficulty” below). Wildflowers viewed this week in bloom on the potential route for the narrow gauge portion include snowdrop bush, fairy lanterns, Chinese houses, larkspur, vetch, wild pea, Indian paintbrush, snake lily, nemophila and woodland star. There is poison oak on the narrow gauge portion. Although it has been cut back please take appropriate precautions if you are susceptible to it. As a participant you agree to obey EBMUD guidelines and directives outlined in the details of the hike below. Your cooperation will make this tour a success. Hope you can join us. Length & Duration: 4 miles roundtrip, 9:00am-3:00pm. If it starts raining we will not travel cross country on the narrow gauge section which is on a very steep cross slope. We will retrace our steps for a total of 6.8 miles round trip. Age: 16 and up. Hikers 16 – 18 year of age need written permission from a parent or guardian, or be accompanied by a parent or guardian. Personal Items: Bring a lunch, water, backpack, sturdy boots/shoes, long pants, water, insect repellent, sunscreen & dress in layers. Reservations: Required. RSVP Steve Diers at sdiers@ebmud.com or (209) 772-8260. Please provide your daytime phone. Difficulty: The first 1.2 miles of the hike will be on existing fire roads with an increase in elevation of 400’. The second mile is on a primitive abandoned road with a drop of 200’ in elevation. The third mile is on the remains of an abandoned water ditch with a drop of 120’ in elevation. The last ¾ mile is cross country on a very steep cross slope. The narrow gauge is on uneven ground with obstacles and part of it is cross country on a very steep cross slope. Because the narrow gauge portion is rugged, undeveloped and littered with obstacles and has a steep cross slope that is why this 4 mile hike is rated difficult. This hike is far more strenuous than the hike to Patti’s Point. Weather: The hike will be cancelled only if there is heavy fog, moderate to heavy wind and heavy rain. The hike will be held under light rain/drizzle weather conditions. Here is a weather forecast link that I find to be accurate and very useful. You can change the exact location by clicking a point on the map. Additionally, the link on the bottom right under additional forecast and information where it says hourly weather graph is very helpful in seeing the timing and intensity of the events. The hike will cancel for heavy fog, moderate to heavy wind, and heavy rain. Ticks: You will be taking part in an outdoor activity in an area that ticks may inhabit. The following are suggestions that will help protect you from tick-borne diseases. Wear light-colored long pants and long sleeves so you can easily see any ticks. Do thorough tick checks after the event. Now there is clothing that comes pretreated with repellant that the manufacturer claims will be effective even after 40 washes. Insect Shield(R) apparel and accessories are available now from top brands such as L.L. Bean, Orvis, ExOfficio, REI, Sloggers, RailRaiders, Outdoor Research, Tilley, Zorrel, Carolina Manufacturing, Buff and others. The University Of North Carolina Gillings School Of Public Health reported that the incidence of tick attachments was reduced by 93 percent among workers wearing Insect Shield Repellent Apparel. The report was published online March 11, 2011 in the journal Vector-Borne and Zoonotic Diseases. Another option is to spray one pair of pants and one shirt with a repellent containing Permethrin (at least 2 hours before use). The manufacture claims the treatment should remain effective for 6 weeks or 6 launderings of the garment. Spraying pesticides containing DEET, Pecardin or Lemon Eucalyptus oil on your skin is not as effective as treating your garments with Permethrin products. Spraying pesticides containing DEET on clothing is NOT effective against ticks. There is a risk of skin reactions when applying DEET so use caution, especially on children. The Centers for Disease Control lists Lemon Eucalyptus Essential Oil as an organic product as an effective repellent for ticks that can carry Lyme disease. In a 2010 Consumer Reports study a commercial product called Repel Lemon Eucalyptus Repellent, from Spectrum Brands rated just as effective as DEET. Insect Shield(R) apparel, Repel Lemon Eucalyptus Pump Insect Repellent and Sawyer Permethrin Pump Spray are available at REI. Poison Oak: You will encounter poison oak. Please take appropriate precautions (long pants are recommended).